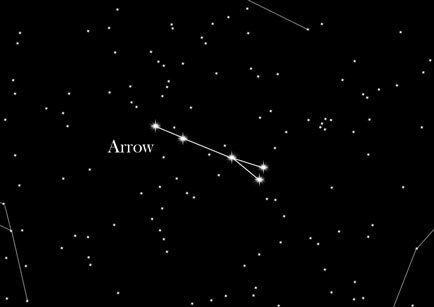 The Arrow is a constellation that consists of only a few stars - and actually looks like a flying arrow. This makes the constellation striking and memorable. Overall, the arrow is the third smallest constellation in the sky. On the other hand, the constellation has been the list of Ptolemy and thereby it is one of the oldest constellations. The Arrow is in the sky north of the constellation Aquarius and actually looks like a flying arrow from west to east. This is by four stars of size classes 3 and 4. The constellation arrow itself lies on our Milky Way, namely between the constellations Swan and Eagle. Other neighbors of the constellation are the Fox, Hercules and the Dolphin. Prometheus is said to have stolen fire from heaven. Zeus had punished him for this, as he caught Prometheus who was placed in desert Caucasus. He had tied him to a rock above a precipice. Without eating, drinking and sleeping, he had to wait there as a thief. Every day an eagle came, called Ethon, and ate of Prometheus' liver. But it renewed again every day, as Prometheus was immortal. The greek hero Heracles then came, and killed the eagle with a Sagitta (Arrow), which is why it now has an honourary place in the sky. This is however only one of several possible myths of this constellation. Another representation refers to the arrow as a cosmic light.